India lives in villages. Elections are won and lost with rural votes. Nevertheless successive governments have done very little for our villages. Most villages have no healthcare facilities,schools, roads,potable water, sewage disposal facilities..etc. Most panchayats are filled with corrupt members who pokcet the money released for developmental activities. In this scenario Rangawamy Elango stands out like a shining star, a beacon of hope. Two childhood images burned into his consciousness forever, shaping Rangaswamy Elango’s life, his philosophy, his mission and his attitude. One was drunken men beating their wives and the other was his impoverished class-mates drinking water during lunch-breaks to quench the fires of hunger in their bellies. He was one of the few in the village school with a packed tiffin box. Unlike the other dalits of his village Kuthambakkan in Tamil Nadu, Elango was well-off because his father was a government employee who owned a few acres of land. Most of the other villagers were however dirt poor. Work was meager. Many wealthy people choose to ignore the distress around them, selfishly cocooning themselves in their little paradise of abundance. But not Elango. 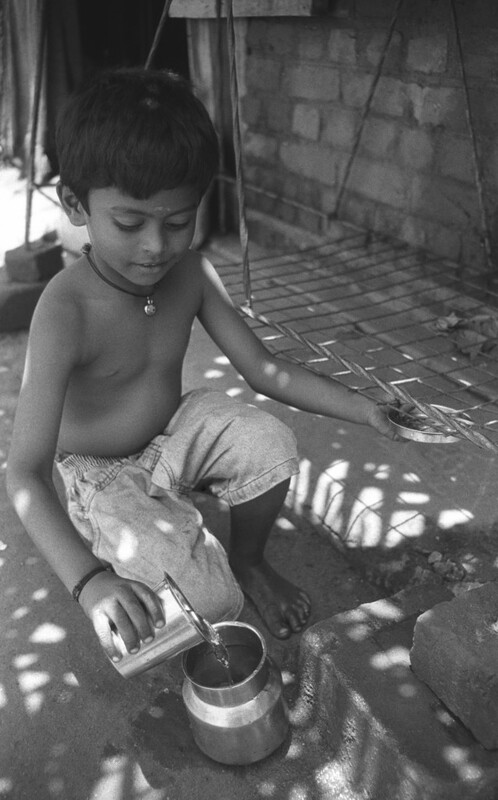 Even as a child, he was deeply troubled by the squalor and hopelessness in his village. Says he: “There can be no individual happiness if there is misery all around.” He felt a desire spring from deep within to do something to improve his neighbours’ plight. He was a good student. The only thing he could contribute was his time and his brains. So he held tuition classes for his school friends. Elango grew up to become Kuthambakkam’s first engineer. After his graduation, he got a job and a posting in Bhubaneshwar. On a brief holiday to his village, he found the tuition centre was languishing; youths going astray as before. He found a job with the Council of Scientific and Industrial Research in Chennai so that he could commute to his village. And his youth club revived. In the course of his work in the 1980s, he met with the Adigalar (head swamiji) of Tamil Nadu’s Kunrakudi math. Dubbed the “Scientific Saint”, the Adigalar was dynamic and philosophical, modern and holy. He believed his villagers could not transcend the material world to attain spiritual progress unless their basic necessities were met – they needed jobs, houses, hygiene, food, medicines, education. Those were the heady days of “import substitution” and factories, the sanctum sanctorum of modern India. With Elango’s help and a loan of Rs.3 crores, the Adigalar set up a factory to make chemical batteries. It was inaugurated with much fanfare and every body was thrilled at this new lifeline that had sprouted on their land. The factory made money but the village didn’t really benefit. First of all, it generated only 18 jobs and most of them went to people from Madurai. Clearly, this was the wrong model for the village – high investment, few jobs. The Adigalar pursued a new strategy – he started village industries. Actually, it was an older Gandhian strategy to provide oxygen to village economies. He started a cashew unit – groups of men collected raw cashew nuts. Women roasted and broke them. The nuts were packaged and sold. From the cashew shell, they extracted oil and made paint. An investment of Rs.5 lakhs provided jobs to 60. This turned out to be a successful model and so he repeated it – starting a chalk making unit, a bakery, a tailoring unit. This model had a profound impact on Elango. Says he: “I realized then that India would prosper only if our villages prospered. Production by the masses, not mass production is the key”. So Elango gave up his job and returned to his village, much to the chagrin of his father and wife Sumathy. But Elango yearned to be a social activist. That was his calling, his mission. He activated the local youth, fought illicit brewers, started a cattle feeding unit. Life was difficult, but then came Panchayati Raj in 1996. He contested for the post of Kuthambakkam Panchayat President and won. Elango was thrilled. In this saddle, he could fulfill his dreams of becoming an effective social reformer who would transform his village. But his dream soured into a nightmare. Initially things went well. Elango’s drive, enthusiasm and energy were infectious. Gram sabhas (village councils) were established, roads were concretized, earth works undertaken, ponds deepened, check dams created, water canals revived. Government development funds were used to implement these employment generating schemes. Villagers got jobs, children were fed. Illicit brewing stopped. Women became bolder, youth more involved. Wife beating reduced dramatically. Hygiene was a major problem in the village. Lack of proper drainage was a festering source of filth, bad smell, pollution and disease. At the outskirts of the village was a granite factory that paid people to dispose off their granite waste. Engineer Elango realized he could kill two birds at the same time. He could get the waste granite cuts and use them to build drains instead of rubble that disintegrated in the next rains. The government had sanctioned Rs.15 lakhs for this task. He spent only Rs. 4 lakhs, almost all of it on wages for village labour as the raw materials were mostly free. The villagers were delighted, the granite factory owner was happy and Elango was thrilled. But not for long. Instead of getting a medal, he was suspended from office! He had violated the project specifications – the contract specified he would use rubble from a nearby hill. Elango realized he had unwittingly stepped into a dangerous hornet’s nest. The system did not work the way he envisioned: save public money, employ local labour, implement projects quickly, benefit the locals. The system thrived on “vested interests”. Project costs were inflated so that lobbies got their cuts. Rubble from the nearby hill was specified in the project to benefit the local quarry owner. It had to be ferried to the project site, so lorry owners benefited. And so on. Elango slid into depression. He felt wronged, betrayed, humiliated. His world of innocence shattered. The real world had no place for honesty, goodness, ethics, justice, fair play. It thrived instead on corruption, networking, exploitation, injustice. He had only two choices – to retreat or to fight back. As he had committed no sin, he opted for the latter. He went to Chennai, met the government Secretary, argued his case, urged him to hold a village council where he could publicly defend the charges against him and allow the people decide. He contacted the local media too. 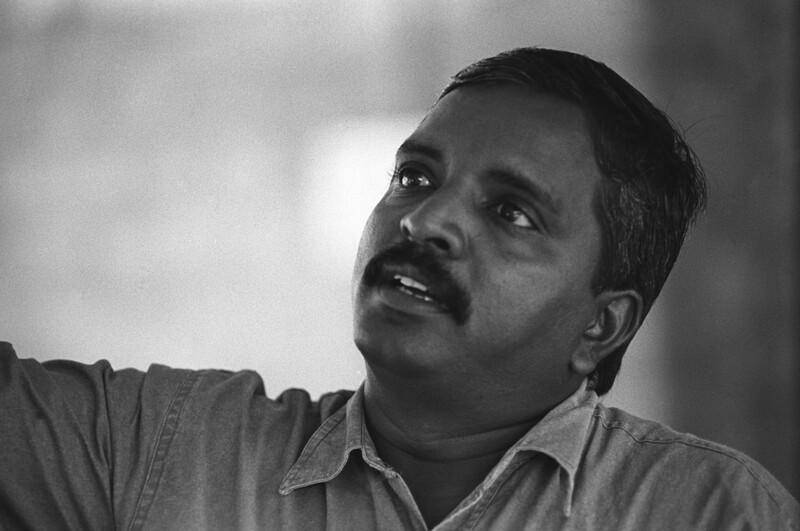 On January 10, 1999, 1,300 people gathered to hear Elango’s impassioned defense. Before the sun set that day, his suspension was revoked. Life is full of ups and downs. It’s never a straight line as Elango’s life demonstrates. Success and setbacks are two sides of the same coin. You are invariably faced with one or the other. Elango won another five year term as Panchayat President. During that tenure, he implemented a successful housing project. The houses were 40 % larger and better designed, but much cheaper than other similar government housing colonies because Elango used local materials for construction and employed local labour. Still, he lost the subsequent elections. But now he is not depressed or deterred. Jobs, power, kudos, brickbats come and go. But one must stay true to one’s spirit, until one’s body and mind permits. 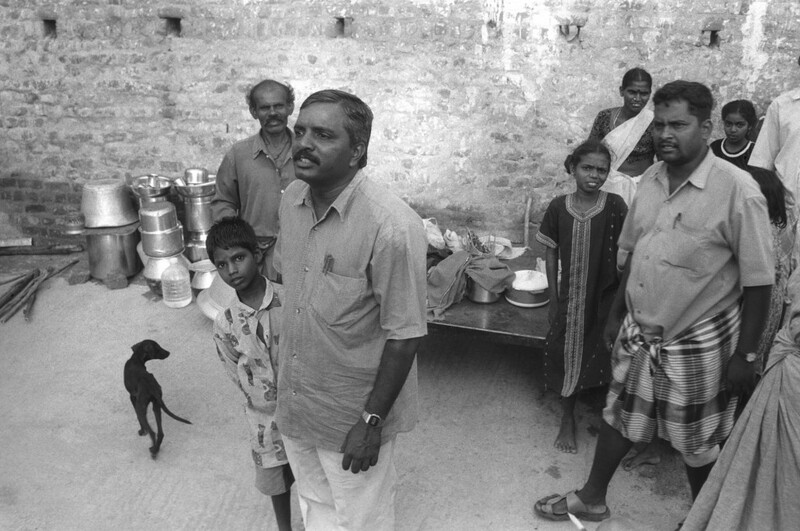 Elango runs his own NGO, which is an ongoing experiment in self-sustaining village economy. He has modeled his project on the Gandhian vision demonstrated by Adigalar. A quick calculation showed that Kuthambakkam villagers together spend Rs.60 lakh a month on every day consumer goods – soap, detergent, clothes, food, electrical items. Goods worth Rs.40 lakh could be produced locally – this would then provide jobs to local people and the local producers would earn the money. A portion of the money would thus remain in the village and this would bring about an improvement in the living standards of Kuthambakkam. Surplus products could be sold to and bought from the nearby villages. It’s a pilot project, but Elango has already formed a network of 600 panchayats spread across many states. Of the 700 villages in the vicinity of Kuthambakkam, Elango wants to create 50 model, self-reliant villages. The Panchayat presidents of these 50 villages are supportive, hopeful and enthusiastic. In a sense, it is going back to one’s roots, but armed with all the modern tools, methodologies and philosophies – using Information Technology, fuel-efficient gadgets, environment-friendly processes, computers as teaching aid in schools, technological improvements, empowering women, grass-root networking and fighting social ills. Says Elango: “Percolation theory has not worked. Trickle down benefits have been too little, too slow. We have to make our villages strong, self-reliant, autonomous and viable through effective and decentralized local governance. We have to re-discover our inner strength, our core-competence.” His jargon may be modern, but his philosophy is ancient. Straddling both the worlds with equal grace and respect could be a way forward. In a way, back to the future. Elango was the President of the Panchayat of Kuthambakkam, a village near Chennai for 9 years. 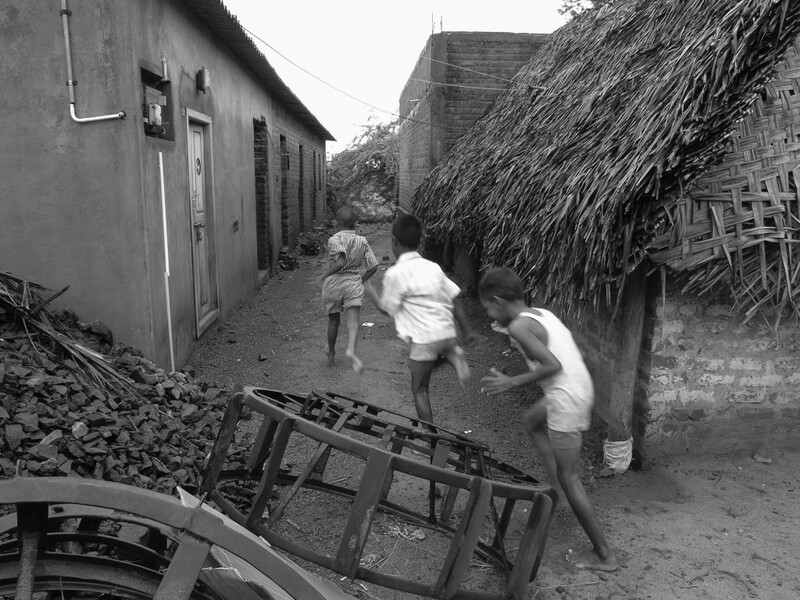 Till few years ago, the village was fraught with poverty and lacked basic infrastructure. Violence against lower castes and women was rampant, had 35% of its population was involved in illicit liquor brewing. Today, the village has been transformed and has good basic infrastructure in place. The villagers are now busy building an environment-friendly local economy based on a cooperative model, producing their basic necessities (like food and clothing) within their own village. Inspired by Gandhi, he has successfully implemented his vision of true “Gram Swaraj”, a self-sufficient village. 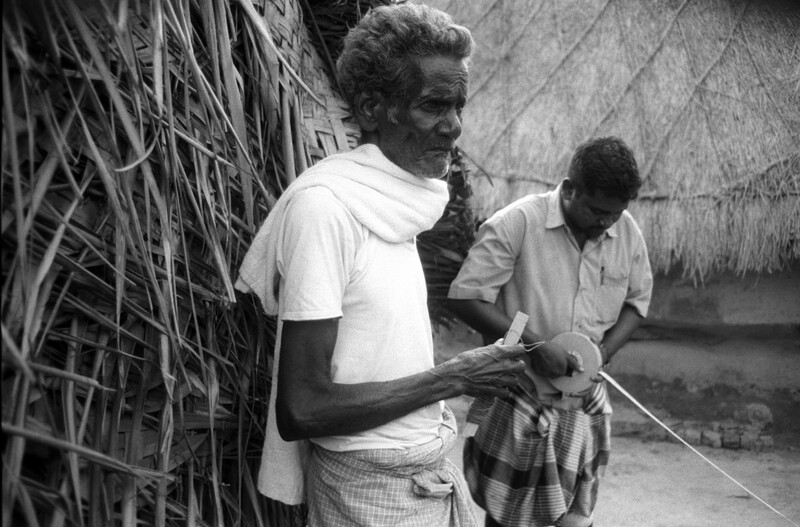 An old man watches as panchayat workers of Kuthambakkam measure the land to build his house. He had always lived in a hut. Elango’s efforts have helped the poor to own a pucca house without getting into debt traps. Two childhood images burned into his consciousness forever, shaping Rangaswamy Elango’s life, his philosophy, his mission and his attitude. One was drunken men beating their wives and the other was his impoverished class-mates drinking water during lunch-breaks to quench the fires of hunger in their bellies. He was one of the few in the village school with a packed tiffin box. Elango grew up to become Kuthambakkam’s first engineer. After his graduation, he got a job and a posting in Bhubaneshwar. During his visits to his village, Elango was pained to see the constant degradation of the society and the land. Elango yearned change this. That was his calling, his mission. Finally he gave up his job and returned to his village, much to the chagrin of his father and wife Sumathy. He activated the local youth, fought illicit brewers, started a cattle feeding unit. Life was difficult, but then came Panchayati Raj in 1996. He contested for the post of Kuthambakkam Panchayat President and won. Elango was thrilled. In this saddle, he could fulfill his dreams of becoming an effective social reformer who would transform his village.